The Korean Domestic Agency understands how to consolidate the enthusiasm of all CAD working group members. Over two years ago, Newsline reported on efforts by the Design Office to streamline design activities between the ITER Organization and the seven Domestic Agencies. The streamlining efforts were undertaken in an effort to meet Procurement Arrangement schedules in the timeliest manner. "The ideal," says Eric Martin, Head of the ITER Design Office, "is to have a global design office ..." incorporating dedicated design teams assigned by each Domestic Agency that are available to work—in real time—on the same projects as their ITER counterparts." Excellent progress has been made toward this goal so far. 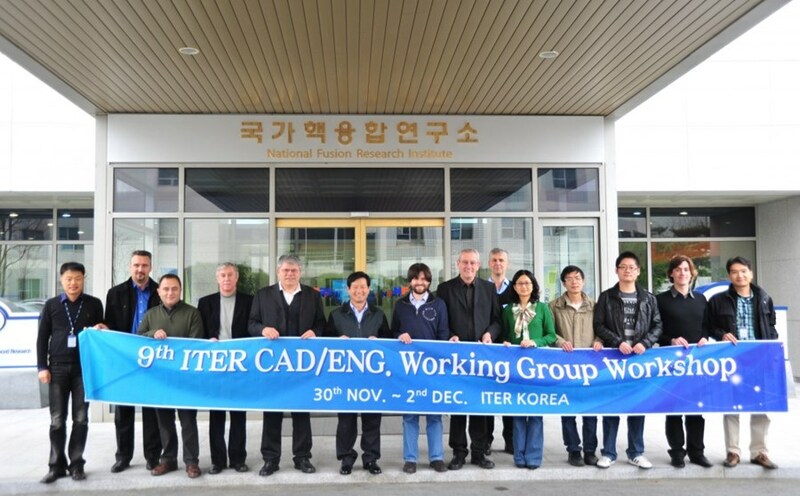 This week, streamlining efforts took another big step forward as representatives from the ITER Design Office met with their professional counterparts from the seven Member states at the Korean Domestic Agency in Daejeon in order to discuss how to improve ITER worldwide collaboration. "The timing of this meeting has been quite opportune," Eric Martin reports, "enabling the computer-aided design (CAD) working group members to analyze the feedback from the past two years of growing collaboration in this area." Thanks to the successful partnership established over past years, all Domestic Agencies are now connected to the ITER CAD database, where models and drawings are archived. A preliminary "test pilot" was implemented this year, which allows more than 60 CAD designers from the Domestic Agencies and their suppliers to work in tandem with colleagues at ITER Headquarters in France. Multiple users can thus access the required data, simultaneously, and exchange data practically in real time. In addition, the newly available opportunity for asynchronous, as well as scheduled, exchanges has fuelled the completion of more than 1,300 CAD data exchange tasks. 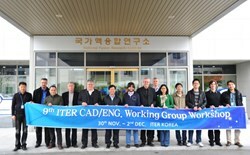 At the workshop held in Daejeon this week, particular emphasis was placed on improving the efficiency of the global design office and reducing the associated costs for both the ITER Organization and the Domestic Agencies. Measures discussed included simplification of procedures, ways to share software, licenses and methodologies, automated operations, efficient CAD viewer, web access, standardization and CAD catalogues, system performances, the management of changes in the CAD manual, the CAD handbook and the purchase of licenses for all ITER contributors. Another very important point on the agenda was the compliance of the CAD infrastructure with ITER's quality requirements. Further to the deployed processes and tools now in place, the great team spirit of the CAD working group members will continue to support the activities and joint efforts of the 400 CAD designers that will work on the ITER design, through the Domestic Agencies and their suppliers, in the year to come. The courtesy shown by the Korean Domestic Agency and in particular by its Director, Kijung Jung, has this week once more served to further consolidate the enthusiasm of all CAD working group members. All participants appreciated the very kind and well organized workshop and social program, which allowed us to discover some fascinating aspects of Korean life and culture, as well as the opportunity to tour the KSTAR facility.